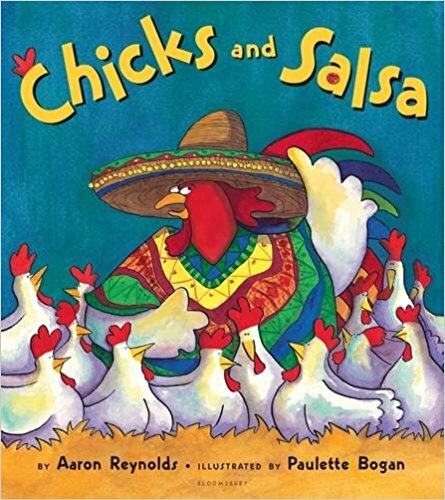 There can be only two possible interpretations of Chicks and Salsa: (1) It’s a children’s picture book about anthropomorphic barnyard animals personified as Mexican thieves, or (2) It’s a children’s picture book about anthropomorphic thieving barnyard animals pretending to be Mexicans. Reynolds’ whimsical, repetitive wordplay would be great fun if the context were not offensive: While “no one was quite certain” (“where the chickens got the chips,” “where the ducks got the avocados,” “where the pigs got the nacho cheese sauce”), everyone will see the mice, selling their illegally procured wares to the “Mexican” farm animals. And, although he directly states that Farmer and Mrs. Nuthatcher steal the rest of their own produce, yet just hints at the “Mexican” farm animals’ thieving actions (they “took” tomatoes, “uprooted” onions, “selected” cilantro, “gathered” garlic, “borrowed” beans)—the gang symbolism in the images of the shady-looking mice is an unmistakable signal that the behavior in which the “Mexican” farm animals are engaging is criminal rather than merely resourceful. The “Mexican” animals—or the animals as “Mexicans”—are stealing. And the “Mexican” animal thieves are celebrating their theft with a “Mexican”-themed party. Bogan’s super-bright, saturated ink and watercolor scenes are reminiscent of the older Warner Bros. cartoons. 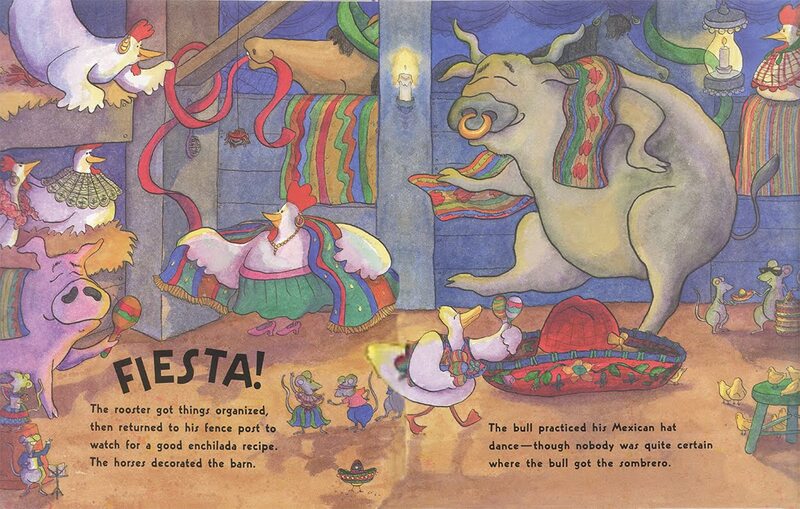 In the double-page spread depicting the animals’ “FIESTA!” the hens wear skirts and serapes and one wears rosewood Mexican beads as well, the horse wears a sombrero and the bull dances on one, the female mice wear faldas (short Mexican skirts), embroidered Mexican blusas and gold hoop earrings, one of the male mice wears pantalones and a short-sleeved shirt, and another wears a vestido. There are woven blankets, a stack of tiny mouse-sized sombreros, painted wooden maracas and ribbons everywhere. They. Are. All. Mexicans. However, despite all the Mexican colors, Mexican cultural markers, Mexican foods, and a smattering of Spanish vocabulary, neither the text nor any of the published reviews note that the animals are “Mexican” and that they are thieves. All of the published reviews from journals that librarians generally consult when making choices (in this case, Horn Book, Kirkus, Library Media Connection, Publisher’s Weekly, and School Library Journal) are positive, and, although the reviews name foods that are clearly Mexican (enchiladas, guacamole, nachos, salsa, tamales) and note the Spanish vocabulary (“fiesta,” “Olé!” “salsa,” “sombreros”), they all unquestioningly refer to the scenarios as “southwestern” or “southwestern-themed,” or, in one case, “culturally tapped-in.” Although one would think that this would be obvious, not one of the reviewers describes the barnyard animals or the theme as having anything to do with Mexican people, language, culture, or food. Again: Once the farm animals have stolen most the ingredients they need—and purchased the rest from a gang of mice—they all dress up as “Mexicans” and throw a rowdy “fiesta.” I would like to know the publisher’s rationale for producing a children’s picture book that portrays anthropomorphic barnyard animals personified as Mexican thieves. Mexican or other Latinx kids who experience having these books read aloud in a classroom or library setting will be left embarrassed and confused, while for kids who are not Mexican or Latinx, this exercise will heighten any sense of superiority they may have. Our young children do not deserve this kind of disrespect. No one does. Chicks and Salsa is not recommended. P.S. In addition to all the offensive racial elements in Chips and Salsa, there’s also an obnoxious gender cliché in three aesthetically revolting images of Mrs. Nuthatcher, who wears an unsightly sleeveless green dress, ugly pink flip-flops with stockings rolled up to her knees, bright red hair covered with pink rollers, way too much dark red lipstick and lots of rouge, and pastel-blue 1950s-era cat-eye eyeglasses with pink flowers on the tips. To the right of one of the images is a huge pair of bloomers hanging on the clothesline, probably to call attention to Mrs. Nuthatcher’s extremely large size.